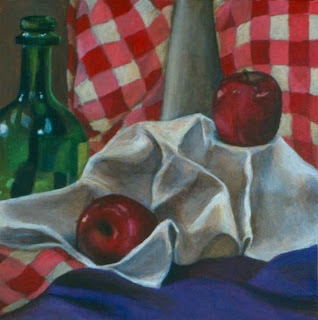 This was one of my first still lifes that I painted after I took a hiatus after graduation. I like the color but I really struggled with the drawing and getting the freehand circles and proportions correct. Here's the other painting I completed in the acrylics workshop. I spent so much time trying to get the shiny stuff right that I almost completely ignored the foreground. I've been scanning in some slides that I made of my artwork over the years, so thought I'd share some of them. This was done in two-day acrylics workshop. 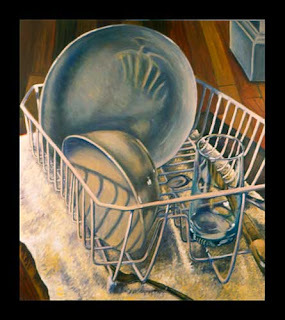 It was my first introduction to acrylics and how they could be used to make realist paintings on canvas. My previous experience with them had been limited to geometric designs for composition classes. 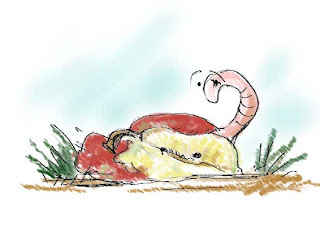 Here's my first Illustration Friday entry, done in Painter. 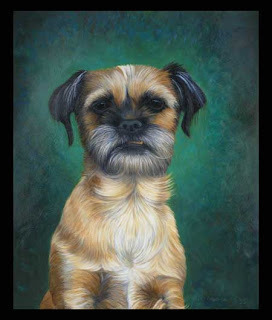 Here's a portrait I did last year of my brother's dog. 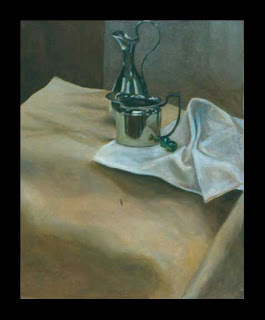 Here's a still life I did a few years ago. 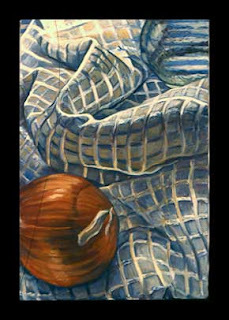 I like the loose brushstrokes and heightened color I used. 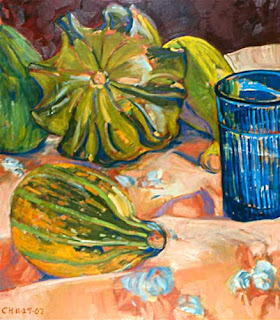 I love painting decorative squash. Here's a painting I did a long time ago. I like trying to paint white items. I love doing contour line drawings of things around the house. This is the mirror that I set my still life items on, some day I hope to make illustrations where I color these in. 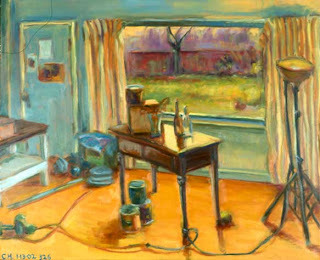 Here's an interior of my studio showing the table I use to paint my still-lifes from. I started a new painting today. 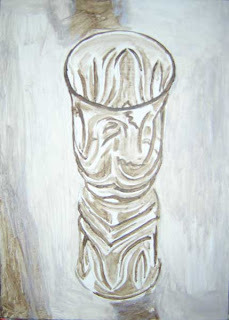 This is the underpainting done with Raw Umber and Titanium White in Acrylics. 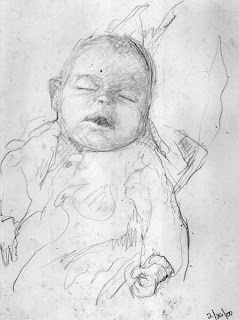 Here's a sketch of my niece that I drew when she was one day old. My sister-in-law was holding her while she slept. 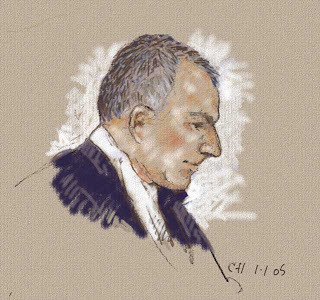 I did this using Painter 8 a couple of years ago. I still haven't gotten around to learning that program completely. I like the way textures can be used and I love the way it emulates certain drawing materials like oil pastel and charcoal. This is an illustration I did in Painter. I don't really know how to use the program, so I was basically just fooling around with it. 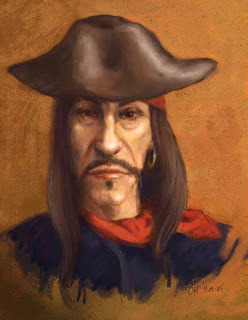 I drew it completely from imagination, hence the goofy, unreal-looking pirate hat. 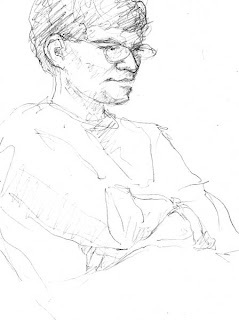 It's based on a story by Herman Melville, "Benito Cereno." 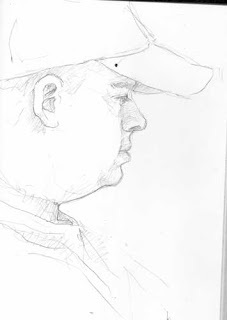 A sketch of a co-worker I did a couple years ago. 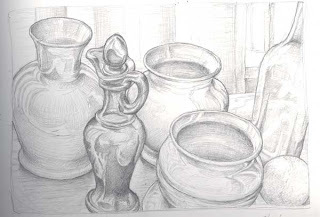 Here's a drawing I did a couple of years ago in preparation for a still life painting. 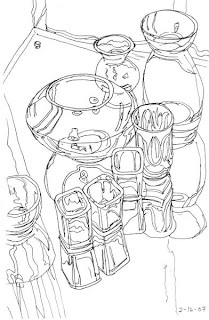 I love drawing glass vases and bottles and spent a bit of time on this drawing done from life. 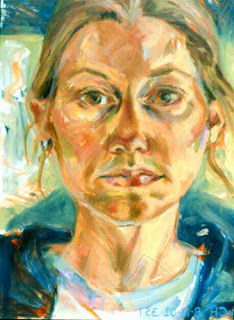 Here's a self-portrait study I painted a while ago. I was experimenting with a looser style than I usually use.